You are now looking to see the differences and comparisons between Canon SL1 and Nikon D3300, aren’t you? Well, you have come to the right place! Here, we will outline and explain the differences between Canon SL1 and Nikon D3300 to help you decide which model that you better purchase. 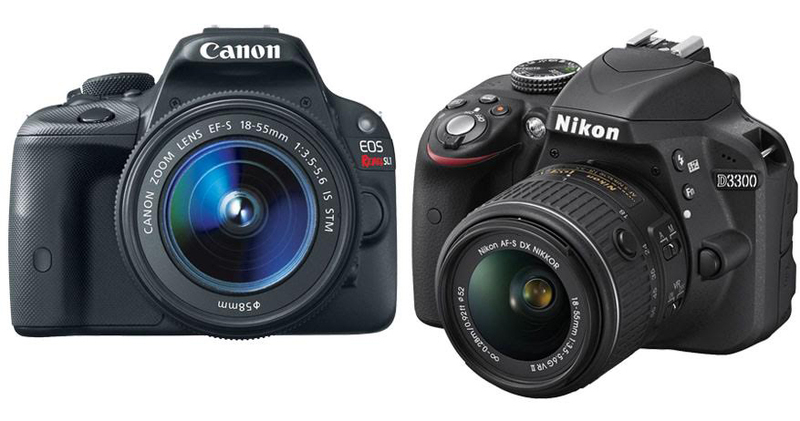 Both Canon SL1 and Nikon D3300 are DSLR cameras available in the same price range. Both items bring big names; both Canon and Nikon are known worldwide for producing high-quality cameras since a long time ago. Canon SL1 boasts a significantly compact and lightweight body. Meanwhile, Nikon D3300 still retains the typical yet functional body design of a Nikon DSLR camera. Continue reading below. Do you like the anti-aliasing filter? If you do, then Canon SL1 can be great. It has an anti-aliasing filter that is effective in reducing moire in the pics. Another advantage that Canon SL1 offers is the on-sensor phase detection, which allows the AF to be faster and more powerful in tracking moving objects. This is useful for live view and videos. If you don’t like the anti-aliasing filter, then Nikon D3300 should be your choice. It is without the filter, allowing for sharper images. Besides, Nikon D3300 indeed comes with a more powerful image sensor. It has higher optical resolution and delivers deeper, more accurate colors. It is also faster when shooting continuously, both in JPEG and RAW. Plus, it starts up faster so that you don’t miss any moment to shoot. In general, we recommend you to choose Nikon D3300. It has better image quality and better performance. Canon SL1 is only viable if you need a very compact DSLR camera for some reasons or you can benefit from the phase detection AF and the anti-aliasing filter.